The Goodman HKSC10XC is an electric heat kit. It comes from the HKS line, which is intended for use with Goodman air handlers. 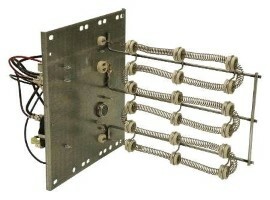 This model uses rust-resistant nickel chromium heating elements and has 10 kW nominal heating. This Goodman heat kit features sequences for better temperature control. It has multiple branch circuit capability and has been completely assembled and tested so our customers know they are good to go. Plus, Goodman electronic heat kits are known for being easy to install and a plug-in wiring harness makes it simple to fit into the air handler. This particular model comes with factory-installed circuit breakers for improved safety.